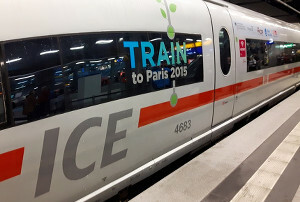 Delegates from almost 200 countries will join the climate conference COP21 in Paris, France with the common goal to achieve a legally binding and universal agreement on climate, with the aim of keeping global warming below 2°C. 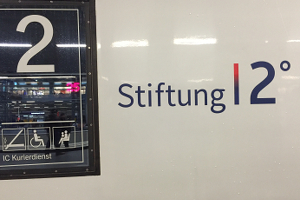 The Stiftung 2 Grad wants to manifest the support of the German economy for this new climate agreement and therefore invited supporters and guests from business, politics and the media to travel together on the “Train to Paris”, of course CO2-neutral. Topics such as climate friendly mobility, renewable energies and efficiency in resources where presented in various round tables, presentations and panel discussions. Among the participants where the German Secretary of the Environment Dr. Barbara Hendricks, Ronald Pofalla, Dr. Michael Otto, Prof. Dirk Messner and selected CEO’s from large German corporations. Together with the president of the board at Stiftung 2 Grad, Sabine Nallinger, I had the honour and privilege to host this incredible Event on our way to a political event that will determine the future of our planet.